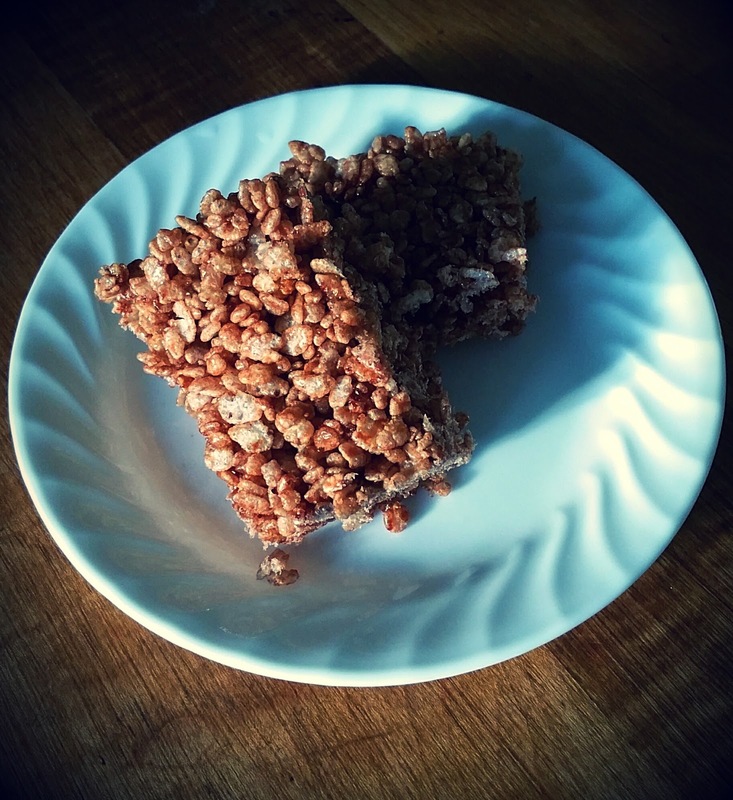 Rice Krispie cake is awesome. 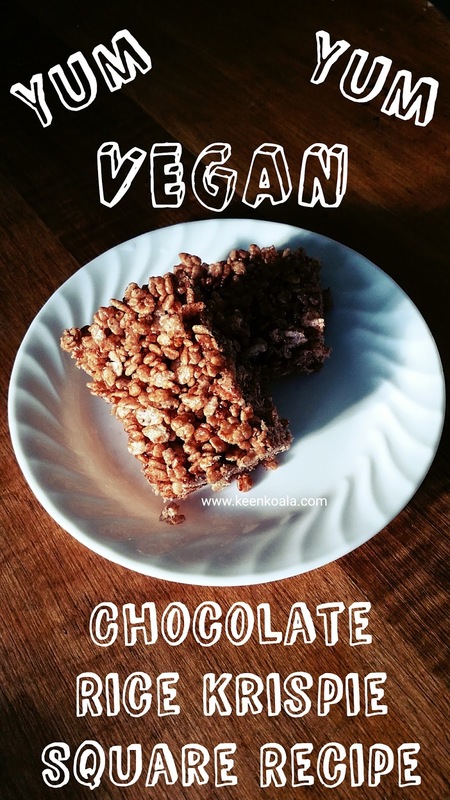 It has got to be one of my all time favorite easy to make treats. The only bad thing about it is that it contains an ingredient that vegetarians and vegans can't eat, marshmallows (gelatin). Now, I know they do make vegan marshmallows now, but they are expensive and many people don't have access to them. I thought up this recipe the other day when I was trying to figure out something for dessert using only the limited ingredients I had on hand (it was the end of the week and slim pickins' at the Keen Koala house). They turned out so well that I plan on making them soon to share with my vegan friends and also just for myself because they're so delicious. Sorry about the lack of pictures, I was in a major rush and forgot all about taking pictures until the cake was finished and cooling! But don't fret, it's super simple to make! 1. 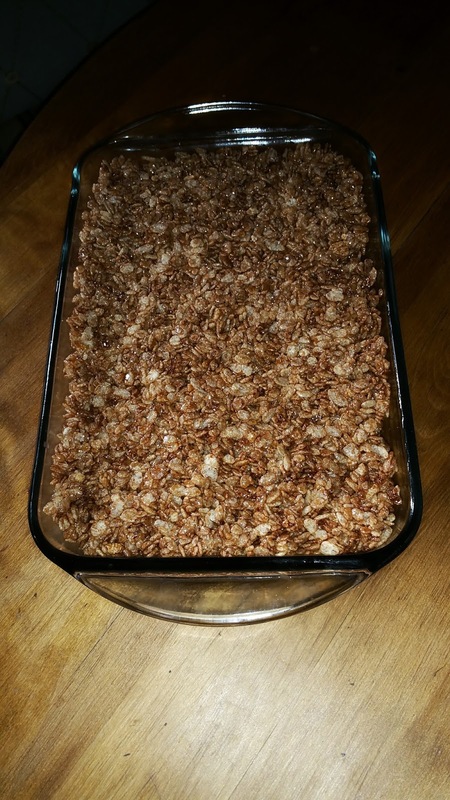 Grease an 8x11 cake pan and set aside. 2. Measure out your cereal into a big bowl. This is where you will do the mixing. Set aside. 3. In a medium sized sauce pan add all of the remaining ingredients (not the cereal). 4. Stir over medium heat until it begins to boil. Allow the sauce to boil for one minute. 5. Pour the sauce over the Rice Krispies. 6. Mix gently but quickly until all of the kernels are covered with sauce. 7. Pour into the prepared pan and then firm down with damp palms. 8. Once the cake is cool, cut and enjoy. Did you enjoy this recipe? Let me know in the comments section below, I would love to hear from you. For more great recipes and instant access to exclusive content and contests, please like Keen Koala on Facebook by clicking HERE!